Whilst not as numerous as at Rosslyn Chapel, Seaton has it’s own interesting Green Men. This is probably the most spectacular. 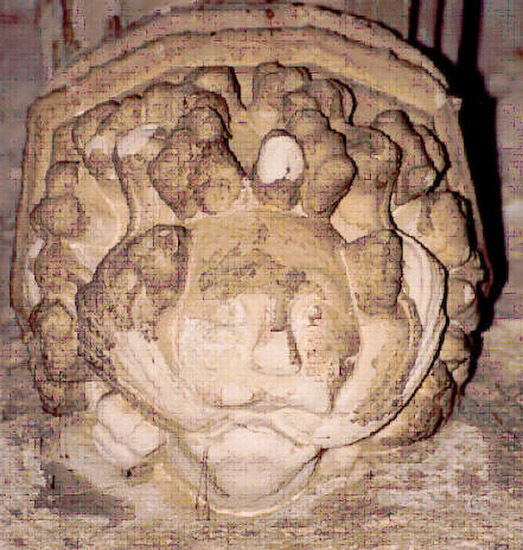 It is a corbel and these were often the subject of more decorative attention than some other parts of a churches’ interior. Here can be seen a classic representation of a Green Man with foliage growing from both corners of his mouth. This symbol was pagan in origin and which represented, in pre-Christian times, the height of the growing season, the peak of fertility and fecundity. The symbol was generally expressive, therefore, of the eternal cycle of the seasons. When Christianity subsumed this symbol it’s mean was changed to represent Christian notions of everlasting life, resurrection and the immortality of the soul. When viewed from this Christian point of view the Green Man becomes a quite acceptable motif and it is only on that basis that Green Men exist within Christian Churches. Some have suggested that the Green Man remains a pagan symbol even when found in a Christian building and this, or course, is quite incorrect.